It has been days of sizzling heat in desert Las Vegas with the mercury staying above 40 degrees Celsius. The wind was hot machiam like as if you were standing in front of the industrial aircon fan. *sizzle* Then when it rain yesterday, it not only poured, it hailed ice the size of stones. The storm came quick and furious and was over before I even realised it as I was working in the showrooms all afternoon. Temperature came back to a more manageable 33 degrees Celsius. It may still be relatively hot, but after baking in the sun in the desert heat, it felt really cool. Apparently there were 3 Cirque Du Soleil going on in Vegas with "Ka" at MGM Grand, "O" at the Bellagio and "Mystère" at Treasure Island. Ling caught the "Ka" the first night was later found out that she was going for "O"(Cirque again??!) the following night. I could her her groaning under her breath for her tickets were already paid up. Had I known, I would have sent her to either "Thunder From Down Under", "Chippendales" or "Krave Men of Vegas". Confirm, chop, stamp, she would be a happier camper come (no pun intended) next morning. As for me, I took a more subtle route to my day as I finished the last day at 4pm. Head back to the hotel for a quick nap before heading down to Craftsteak for dinner. It was yet another excellent dinner down the tummy as we had 16oz. Corn Fed New York Strip and Red King Crab. 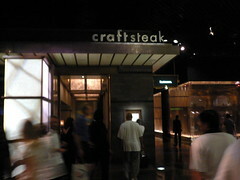 I would rank Craftsteak behind Fiamma and way ahead of SeaBlue. The bill came up to be USD 200 and this time I cannot take it already. I need to make back the money! 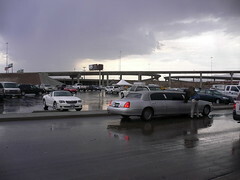 Next, it was time to get to "work" and off to the to Blackjack tables. Initially, I was a bit apprehensive as I started playing 10 a pop. But after going up about USD 100, it was time to shift to the next gear as I start to go for 25 a pop. Hor seh liao. Lim peh kee hong liao! Pit boss came over and took my Club card for signing in. The casino si beh chao kuan as the waitress keep pushing free drinks (USD 1 tip for the waitress lah.) my way but I was aware of the effects of getting me buzzed at the tables. Hah! Nice try as I waved them off time and again and was starting to get a bit du lan. I stood up and left with 400 smackers. Not bad for 3 hours' work. Though not enough to cover all my meals but as a subsidy also not bad lah! Well, I am going to check-out tomorrow morning and head over the LA. I think I will get heart attack when I see my bill tomorrow morning at check-out. Siao liao. David Copperfield's awesome!! I watched him a few years ago when he came over to perfom in the Indoor Stadium. My jaws literally dropped while watching. He totally rocks!! kIm: But one thing about Copperfield was that he aged quite a bit. His parents were there at the show that night too. Haha.. Daddy spent so much..very bad..
ARGHHHH! david copperfield in PERSON! arghhh! he's older, but is he still as hemsum or not ah? hehehe..
ei|een: Compared to last time, less. Some more got perm his hair. But still as witty as ever. Laugh until pengz from start to finish.